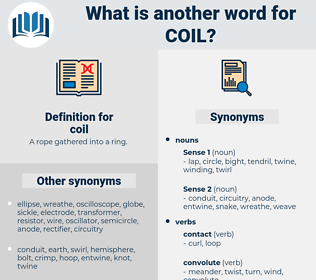 What is another word for coil? A rope gathered into a ring. hush, orderliness, stillness, quiet, calm, order, quietude, peace, rest, tranquillity. It's our passions, our virtues sometimes, that lead us into a coil. I stared at the heavy black coil of twisted hair. choke coil, hank, secondary, astatic coils, solenoid, field winding, primary, primary coil, primary winding, secondary winding, induction coil, secondary coil, head, field coil, read/write head, tickler coil, condenser, armature, choke, choking coil. contraceptive device, structure, tube, prophylactic device, preventive, reactor, preventative, birth control device, contraceptive, construction, tubing, transformer.